It’s the final week of the LIVESTRONG.COM 30-day Burpee Challenge! Are you excited to be able to say you did 50 burpees? Or maybe you’re just looking forward to being done with them! If you want to keep up with your full-body workouts but are a bit burned out on burpees (which is totally understandable), give one of these 10 alternatives a try. This one looks simple, but if you do it right you’ll be working up a sweat in no time. It’s basically the second half of a burpee without the jump, so it’s easier on your joints. HOW TO DO IT: Stand with your feet hip-width apart. Hinge your hips and bend your knees into a squat as you swing your arms behind you. Swing your arms up over your head as you stand up and raise onto your tiptoes, squeezing your glutes and keeping your core tight. Start out slowly to master the form, and then speed it up until you feel the burn. This exercise is kind of like a burpees on steroids — it’s a tough one! But instead of the plyometrics of the jump in burpees, you’re adding a pair of dumbbells as resistance. HOW TO DO IT: Stand with a pair of dumbbells in each hand. Squat down and place the dumbbells on the ground. Jump back into a plank. Row the dumbbells one at a time up to your shoulders. Jump your feet back to your hands, and then stand up. Finally, perform an overhead press, lifting the dumbbells directly over your shoulders with your arms fully extended. Lower them down and start again. If man makers are a bit too much for you after all those burpees, cut out the first half of it and you’re left with thrusters. HOW TO DO IT: Grab a pair of dumbbells (or a barbell) and hold it at chest level. With your feet hip-width apart, squat down, holding the weight steady at your chest. Stand up explosively and use the strength generated from your hips and glutes to put the weight up over your head. Lower the weight back down to your chest with control. Part of a great full-body exercise isn’t just its ability to strengthen a particular muscle group, it’s also about lengthening it. While inchworms strengthen your upper body and core, they also stretch your lower body. HOW TO DO IT: Stand with feet shoulder-width apart. Bend at your hips with your knees only slightly bent. Place your hands on the floor in front of you, and then walk them out until you’re in a high plank position. Perform a push-up by lowering your chest to the floor (or as low as you can). Push back up, walk your hands to your feet and stand up. Another push-up variation like the inchworm, this exercise puts an additional emphasis on your glutes because you’ll be adding a leg lift at the end. If you’re feeling especially strong, add a resistance band around your thighs. HOW TO DO IT: Start in a high plank with hands under your shoulders. Lower your chest to the floor (or as low as you can), and then push back up, maintaining a straight line from head to toe. At the top, lift your right foot several inches off the floor, keeping the foot flexed. Repeat, lifting the other foot this time. This combo move takes the lower-body-sculpting benefits of lunges and adds the triceps-toning benefits of kickbacks. Some exercises just belong together. 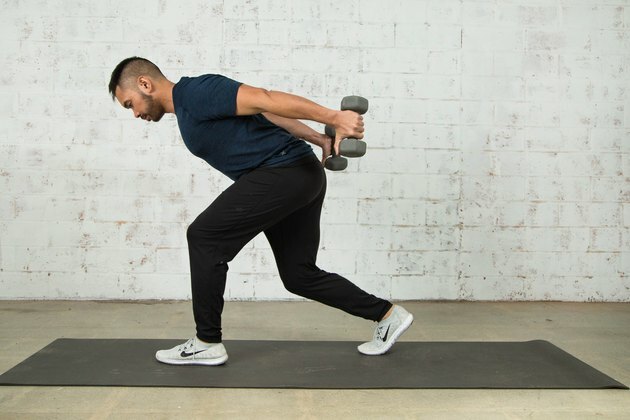 HOW TO DO IT: Stand with feet together and a dumbbell in each hand. Step forward several feet and bend both knees until they’re at 90-degree angles. 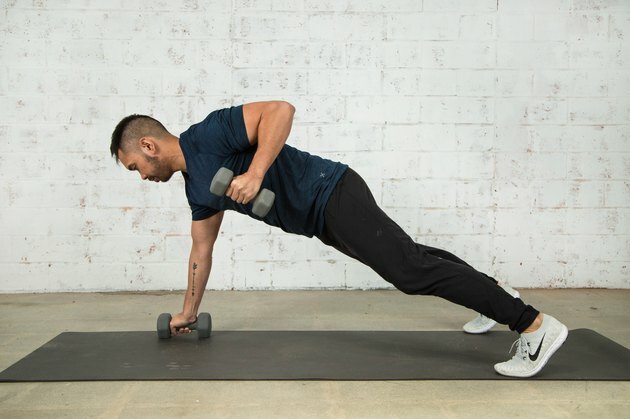 While in this position, lift the dumbbells up to your sides (almost at your armpits), elbows pointing back, and then straighten your arms back behind you. Lower the weights back to your side, then down to the start. Step your feet back together before repeating on the other side. 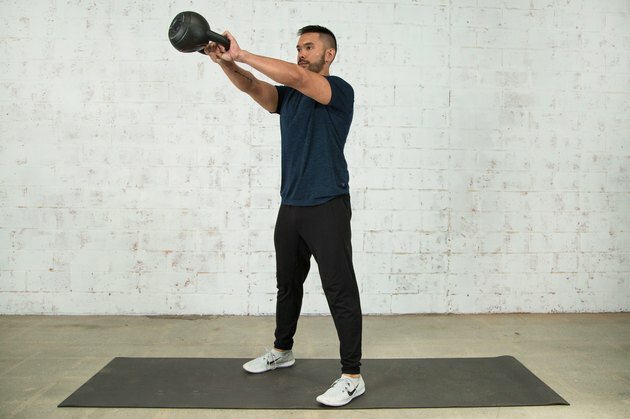 There’s a reason swings are a go-to exercise in the kettlebell community: They’re a great full-body exercise, and they’re relatively easy to master. HOW TO DO IT: Start with feet wider than hip-distance apart and knees bent. Grab a kettlebell with both hands (bell still on the floor a few feet in front of you). Hinge from the hips to swing the bell through your legs and back behind you, keeping your core engaged and your back flat. Use the power from your hips and glutes to straighten your legs as the kettlebell comes back through your legs and up to shoulder height, all while keeping your core engaged. 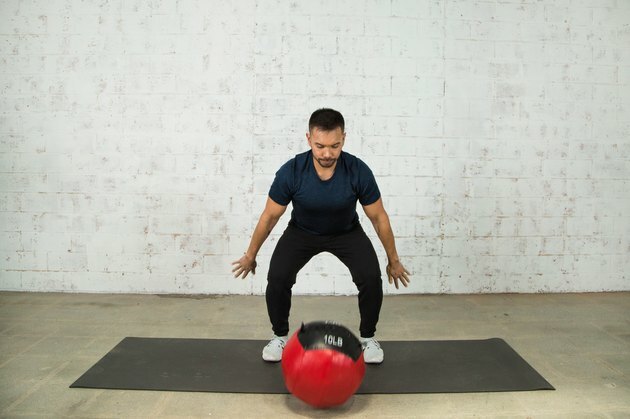 There are a variety of different ways to do this exercise — with a medicine ball, dumbbell, cable machine or resistance band — but no matter how you do it, you’ll be hitting your upper body, lower body and core at the same time. HOW TO DO IT: Stand with feet hip-width apart (or a tiny bit wider) with a dumbbell, medicine ball or the handle of a resistance band or cable machine in your hands. Pivot toward your left as you raise the weight over your left shoulder, arms extended straight (twist and lift onto the ball of your right foot). Then bring the weight across your body and down to the right side, bending both knees as you do this. Stand up straight. Be sure to do the same number of reps on each side. Another combination move, this exercise combines the hamstring strengthening of the deadlift with the back sculpting of the bent-over row. Make sure you pick a weight that you can safely deadlift and row (you’ll likely need something lighter than you usually deadlift). HOW TO DO IT: Stand with a barbell in front of you. Hinge your hips back and bend your knees just slightly as you bend over to pick up the barbell. Keep your back straight and hold the barbell at your shins before using your back (lat) muscles to row the barbell up to your chest. Lower the weight down back to shin level with control. Then, still keeping your back straight, use you use your hamstrings to stand up, allowing the weight to lift naturally as you rise. Lower back down to the start and repeat. This last move is a great one for getting out any pent-up anger, frustration or other negative emotions, as you get to slam a medicine ball to the ground as hard as you can! HOW TO DO IT: Stand with feet hip-width apart and a medicine ball on the floor in front you. Squat down to pick it up. Stand up as you raise it over your head. As you squat back down, throw it as hard as you can toward the floor. Pick it up again and repeat. Ready to put it all together? Try this workout to target every major muscle group in your body and burn a ton of calories in the process. Have you joined the LIVESTRONG.COM Challenge Facebook group yet? Make sure you're tuning in for motivation and accountability from your fellow burpee challengers. And follow our challenge co-hosts Mike Donavanik and Vanessa Villegas on Instagram for additional workout motivation.